As I sit here ready to share my recipe for healthy coconut curry, I feel somewhat hypocritical having not ever feasted on authentic Indian cuisine. But authentic Indian food, does that even exist in Calgary (hit me up if it does)!? Having said that, I tend to be skeptical of eating out at majority of restaurants (I know what I like & I stick to it), because food quality is huge for me. No i don't count calories (although I have in the past), but I do like to be in control of what I nourish my body with. And while many international diets have been dubbed nutritious, the Western take on said diets (or dishes) has in-fact made them anti-nutritious. What do I mean... Ingredients really make all the difference in the nutritional composition of any meal. Generally speaking, when meals are home-made you are in complete control over every component of that meal! You can choose to use olive oil over canola oil, brown rice over white rice, no added sugar over sugar to enhance flavour, local & organic over inorganic produce (you see where i'm taking this). But what do you get at chain restaurants? Lets take a look at Earl's Jerra Chicken Curry. If you take a look at the nutritional information you'll see that this dish contains 1370 calories, 165g carbs, 45g protein, 58g fat, 2480mg sodium... Do you know what the recommended or adequate intake of sodium is per day? 1500mg. This just goes to show how little control we have over what we eat at many chain restaurants. Trust me, I know that there are times when you can't avoid eating out, nor can you control where you eat, but in cases when you can, why not choose spots that emphasize food quality, using unaltered & unrefined ingredients, organic & local (when available), nutrient dense and better for you options! Even though earl's curry is far from what I deem natural, curry need't be a guilty pleasure! The real deal is made from simple & delicious, good-for-you ingredients, contain healthy fiber and plenty of vegetables, anti-inflammatory herbs & spices like turmeric, cumin or coriander powder, sources of healthy fat, unrefined carbs & no refined sugar! The recipe below uses ingredients I love! While I made plant based bowls, you could easily add an animal or soy based protein to the dish. 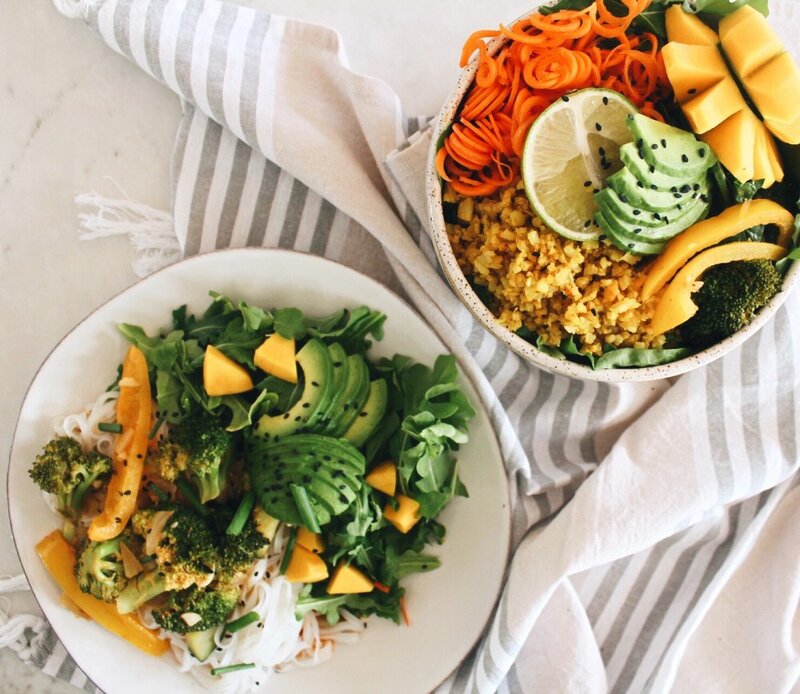 You could swap out grains for starchy carbs like sweet potatoes to make the bowls grain free, rice or rice noodles are also delicious. With so many ways to personalize this dish, you can satisfy picky eaters or those with dietary restrictions! Ready to get curried away in the kitchen? If serving with rice, noodles, quinoa, etc. prepare & cook as per package directions. Set aside until ready to serve. In the meantime, heat a large cast iron pot to medium heat and add 1 Tbsp coconut oil. Add the onion, garlic, ginger, salt & pepper, and stir. Stirring frequently, until softened & golden brown (approx. 5 min). Add curry paste, bone broth or veg stock, coconut milk, & stir. Bring to a simmer & reduce heat slightly. Add zucchini, broccoli, pepper & carrots, & continue cooking on low for 10-15 minutes. Add salt & pepper, as needed. As the curry is simmering, in a cast iron skillet, warm 1 tbsp coconut oil over medium heat & add cauliflower rice, turmeric, coconut aminos, & salt & pepper to taste. Cook until tender. Serve over spinach, rice, sweet potato, rice noodles, amaranth, & top with with fresh lime & herbs.